I’m a zombie apocalypse fan – no doubt about it. The Walking Dead, Fear the Walking Dead, 28 Days Later, 28 Weeks Later – count me as a loyal viewer and movie fan. I’ve had Red Hill in my TBR for quite some time, and I finally got to it when it fit my book club monthly selection. Did this book bring anything new to the zombie genre? No. But some of the characters kept me reading – namely, Skeeter. If Daryl Dixon is unavailable, Skeeter McGee is your guy. He’s big-hearted, full of common sense, owns a plethora of guns, and knows how to use them. The rotating narrative between Scarlet, Miranda, and Nathan gives different perspectives from characters with varying situations and what they go through to survive. Many of the characters are well-rounded, and I especially enjoyed the realistic portrayal of a father willing to sacrifice anything to ensure the survival of his daughter (Nathan and Zoe); however, some of them disappointed me with their unrealistic choices and their willingness to readily endanger the lives of others. There’s also a lot of insta-love going on. And for a weekend house, it sure seems well-stocked, as there’s no mention of supply runs. Overall, I enjoyed this book because I’m a fan of the genre. 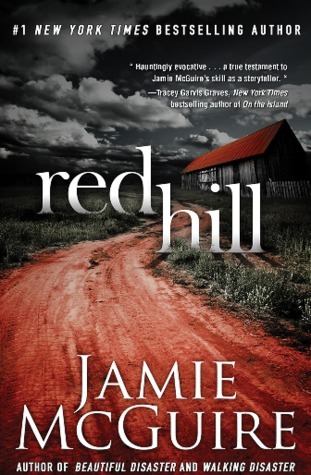 You may have to suspend your disbelief (and I don’t mean about the zombies) over choices, actions, and romances, but Red Hill is a solid read. This sounds really familiar… Maybe I read another commentary. Still a great review, Teri. You make me want to read it. Hugs. Found you in my spam folder, Teagan – have no idea why. Thanks! Not my favorite zombie read, but still interesting. I’ve had a paperback copy of this book for a while but still haven’t gotten around to reading it. I love “plague” type books and films, and was hoping it would stick more to that than going the zombie route. It’s still on my TBR, but not as highly placed as some of my other reads. I felt like this book didn’t focus enough on the plague and zombie aspects. When I looked at the other books by this author, they were more romance/contemporary, and that came across in this book. A lot of time spent on relationships. Hmm… quite odd. Keeping it on my list! Not much of a zombie fan, but sounds like a compelling story. Thanks for sharing. You’d probably enjoy the emphasis on the relationships, Staci. The father/daughter one was something almost any parent could relate to. Yeah, I could definitely get interested in that. Oh it’s been a while since I’ve read a good zombie book! Going on my TBR! Says this is the first in a series, but no sign of a second one yet – and this one came out in 2013 I think? I haven’t read a good zombie book for a while! This one is going on the list! Great review Teri! OOoh Zombies, scary, Teri. Sounds a bit like a remodel of The day of the Triffids. Told you the little boy who created the fondant zombie was after my own heart, Robbie – I’m a fan! Sounds good, Teri. I’m a Daryl Dixon fan too, so Skeeter is likely a character I would also enjoy. Thanks for the tantalizing review! How can you not be a Daryl fan, right? Skeeter could be a distant relative – who knows?